Also making some more mushie tees and tweed pants while little owlet watches Totoro beside me. I'm nearing the end of the piece of fabric, sadly. Hoping equally something brilliant comes my way again soon! Lauren that pear fabric is divine! If you have a size 6 long sleeve tee in brown with mushroom detail (like one I saw at the markets) I'd love to buy it. Now back to look at that pear fabric some more! 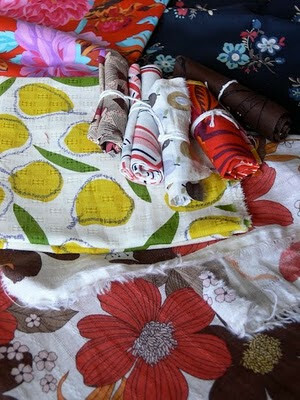 Great stash of fabrics - what a great christmas present. autumnal is great ... the weather is amazing for inspiration. The pears look yummy!! Actually so do the mushies!! Great fabrics - I sure some great creations are lurking amongst them! I just wish I could pull off tweed pants. Even better with a mushie motif on the back pocket. (obviously living in a tweed pant dream world). Autumn depresses me but I reckon that pile of fabrics is enough to excite anyone. ps. thanks to you and your blog my girls are home from school again today. I almost swore at you though when one of them asked me why the water sank by half when I got out of the communal bathtub. I am crap at maths type things and had no idea how to answer past a diagram type thing. But on the other hand would a school teacher do any better? Great fabrics! Love anything tweed! Nice fabric - I noticed the smell of smoke in the air on Monday for the first time - it instantly says winter/cold to me, so I reckon it's a little early too! Isn't it amazing how the world looks and smells and feels different as each month passes by. It's so important to stop and take it all in. 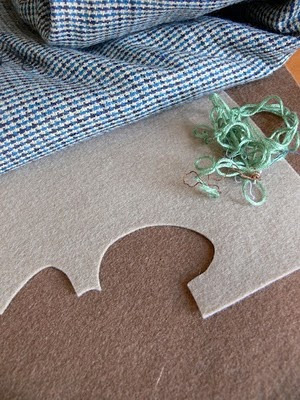 Good luck with the deciding and I hope that some new fabric finds it way into your heart like the tweed did!